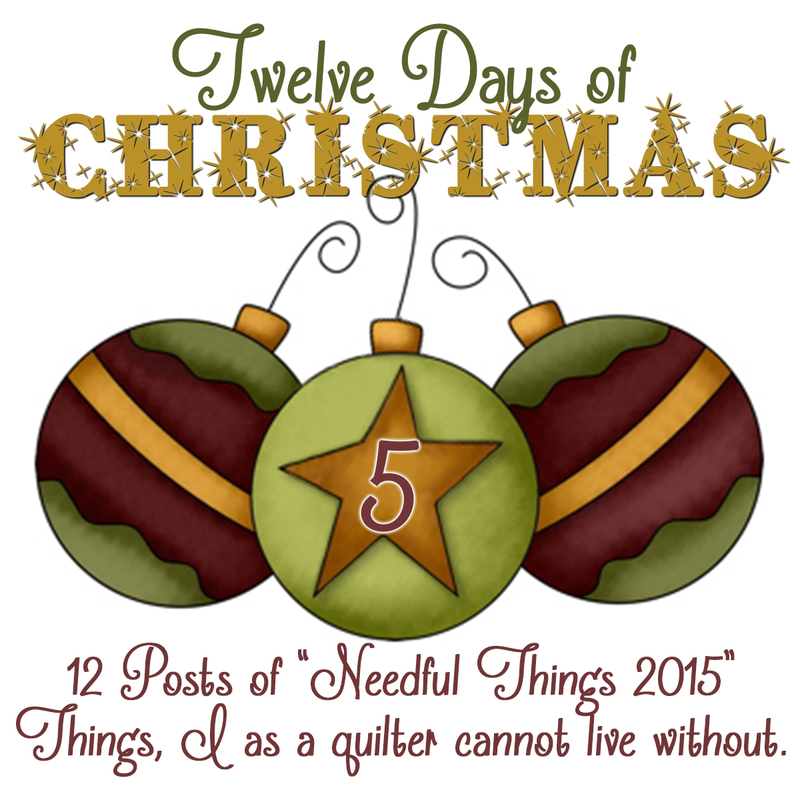 12 Days of Needful Things…Day 5! One of the things that really bothered me this year was the rulers my students were using in class. Now I’m not trying to “pick” on anyone here, but just need to make a point. If you are using some of the rulers you bought 20 years ago when you first starting quilting you may want to replace them…I used someones that I could barely see the numbers…I had some that had these thick ridges for marking lines, I swear they were 1/8″ thick and so on, several classes in several places I had a difficult time using their rulers…. I am putting all of our Creative Grid rulers on sale for 25% off. I believe they are the best rulers out there and (can only be purchased at quilt shops)with the no slip grip built in! So visit this area of our site and see all the rulers and descriptions RULERS… you can order any size or tool ruler we carry…My favorite sizes are 8 1/2″x 24 1/2″—-20 1/2″x 20 1/2″square—-6 1/2″ x 12 1/2″ and then 3 1/2″ x 12 1/2″and of course my PG 3×7 and 6×6 itty bitty eights which feature 1/8″ markings. If you want to learn more about the Itty Bitty’s click HERE…so here is your chance to get a second set or replace some of those older rulers… I also think the 6 1/2″, 9 1/2″ and 12 1/2″squares are all must haves too, I hate it when I’m at the lakehouse and I needed a 9 1/2″ ruler to square up my appliqué blocks and they were at home, so I’m making sure I have everything I need in all my stitching spots!!! All rulers except the souvenir one will be show up 25% off in your cart…The souvenir is always at an amazing price because we want you all to have one! By now you should all know the drill about commenting and holding and whatever, I can’t wait to see who all the winners are!!! Comment and tell me today if you are all done with you holiday prep or are you still buying? or what all has to be done yet!!! 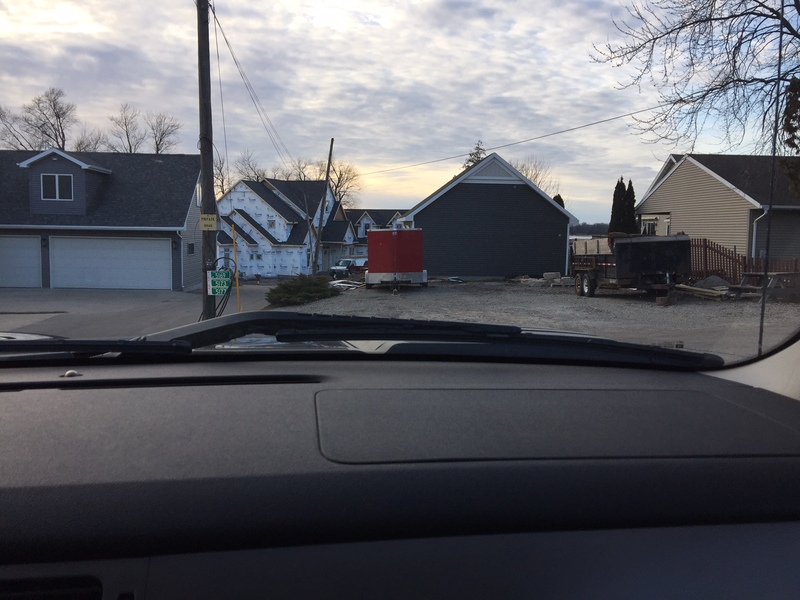 This was the update yesterday at the house… The lakehouse sits at the end of a private road…that grey garage behind the red trailer is ours too. We purchased the lakehouse in 2012 and have had wonderful times here with family and friends, but now its time to live here full-time …we have a irregular huge lot, that has lake frontage and channel frontage, its like a huge L …so to the left of the house is the lake …straight ahead is the channel and the lake on the other side of that too.. You can see that the lake is just now starting to freeze…it was windy and cold so I didn’t go around to take a pic of the channel view..later…but here is what happened yesterday… Most of you will “like” this…it is a small office in back of the kitchen, it goes to the mudroom and on to the doggie room…yes…Presley and Jeter will have their own room…and their OWN couches!!! Our house was custom designed to be exactly 58 1/2 feet away from the lake at every point. We were about 30 feet from the lake at the closest point before and now we have used every possible sq.foot and still be in compliance. Every one of those corners are the farthest we could go…I’ll post the back views at a different time.. but some you asked for the lay of the land…lol…Oh…I almost forgot the best part…above the garage is my sewing studio!!! Take care.. Previous Post 12 Days of Needful Things…Day 6! Next Post 12 Days of Needful Things…Day 4! Thanks for sharing more pictures of your new house. Keep them coming. I love seeing them. May need a couple of the rulers for friends. We have snow today. love it. Your house will be amazing. Love the tile as it reminds me of EPP. Thanks for all you do and a Merry Christmas. I’m think you will have a wonderful home/retreat. So happy for you! What as awesome looking design! I wish you smooth sailing into your new home when it’s finished. As of yesterday when I delivered a Christmas stocking I had sewn for a friend’s grandson, I have everything done except the baking which comes tomorrow and probably Tuesday too. Today is an hour’s trip to Newport for my birthday with a meal at our fav restaurant. Love riding along the ocean past those huge old homes! When it’s dark, we’ll ride around elsewhere on the island and look at the lights. Thanks for posting the “layout” pictures. It looks wonderful, and I’m so happy for you. Keep posting. You make a good point about the rulers! I’m nearly done with Christmas prep. I got a wild hair last night about 10:30 and stayed up past midnight wrapping gifts. Not ready yet! Still baking, shopping & wrapping to do! It’s the same for me every year… As if I don’t know Christmas falls in the same date every year! LOL! Thanks for sharing your home construction with us. It looks like a fantastic location. Enjoy. Lisa, it looks absolutely beautiful. So happy for you. What a wonderful home for you and your family. Wow I really need more rulers. Need a new 91/2 X11 one. I’m all ready for Christmas! Can’t wait for one of my daughters to fly home this week. That’s the best gift! Well, I still have a ton to do….but thankfully I always manage to get ER all done just in time !! I live a good contest and I enjoyed reading your post. Hard to live in two places! I’ve tried and couldn’t do it. A girl needs all of her stuff in one place…it’s been busy for me this Christmas.. I’ve done most of my shopping online, but need to go out and buy my hubby some things. All wrapping done for now…until I go shopping again. Been working every weekend, but I still managed to get a few cards in the mail! No baking for me this year, but next year will be a different story..Love the info on your favorite rulers and the pics on your beautiful home. The hexi floor is beautiful! 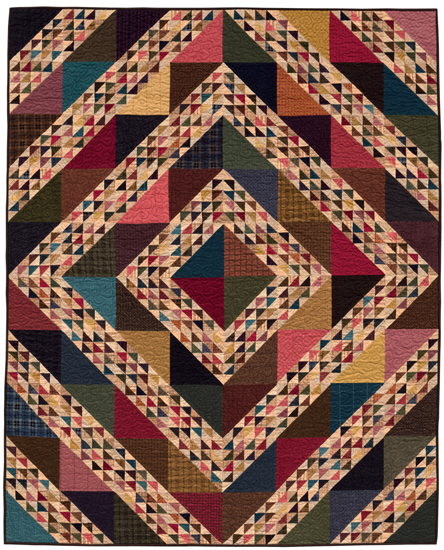 Those tilers of yours would make great quilters! It’s perfection! Have a great day.. Off to get my hair done! What awesome views you’ll have! I’m finishing up getting ready for Christmas today. I just have to box up some goodies for my son’s and I’ll be finished until it’s time to cook on Christmas day. The home is coming along so well! I love that the furry members are remembered. They will really appreciate a place of their own when they have had enough of their humans. I love the new rulers. I have a 6″x 24″ that I love but I could really see that 8 1/2 ” and that extra 1/2 on the other working so well. I have been making a bigger effort to match my rulers. It is nice to see all the needed sizes by the same manufacturer. Off to Goodwill to drop off more coats, it has been too hot to need them but hopefully someone can be prepared. Loving everything about your new home. More so because it still holds all your family memories. Many more to make. Lots and lots of hugs. Love, love, love Creative Grid rulers. After my first one; I got rid of all my other brands and have not had any other kind since. House is beautiful. Not ready for Christmas but very close. Grandson home on military leave; so very excited to spend time with him. Luv your work…always so creative! Love, love, love the progress on your new house. Great attention to detail . The house that quilts built! I must echo your point about “fat” lined rulers. One brand in particular is impossible to use in MHO. I was so glad when Creative Grid rulers came out. I must replace my old, bald ruler. It is time. I understand what you are saying about the “old” rulers. Somehow, it is hard to throw them away but little by little, I am replacing them. The house looks amazing!! I really love the Creative Grid rulers and am slowly adding to my collection!! I love the no slip rulers. Great photos, love watching the build. I’m ready for Christmas, with it being just my husband and I not a whole lot to do (in my eyes that isn’t a bad thing). LOL. Lisa I do have a questions on rulers, I once heard a quilter should always use the same brand ruler for quilt projects to insure accurate cutting. What are your feelings on this? Thank you. I enjoy seeing the lake pictures and how great is it that the puppies have their own room. Have to repair 2 ornaments and wrap 2 gifts. Merry Christmas. I am finished with Christmas prep, but only because we are out of town until the 23rd. Your new house looks beautiful and I’m sure you are dying for it to be finished so you can move in!!! Your lake views will be awesome – I’m envious. I still have some mini-stockings to make for my husband’s family, and a few more gifts to buy, plus some baking, but all is good. Thanks. Love that ruler, I have several from local shops. I would love to have one from PG. My favorite ones are the 2 bitty rulers I purchase from you in Paducah. They made me rethink my quarter inch and strive for accuracy. My oldest ruler is from the early 90’s and the numbers and lines are about gone. It has a lip that drops down on the edge of the mat. I wasn’t a quilter then but loved the whole mat, ruler and rotary cutter thing. I could cut out dress patterns for my girls using weights and a 28mm cutter very quickly. Lisa love the pictures of your house! Can’t wait to see your sewing studio when it’s done. I’m still working on getting some cards out :). I like to make mine so that slows the process a little. I agree with your thoughts on the rulers and I love the Creative grid ones! Love the Hexie floor.All my shopping is done, but still binding. Last part of a quilt made by Stacey and myself. House is looking great. Every time I think I am ready, I remember another thing I forgot to put on my list! Since my husband passed away, I have been so fortunate to have been invited by my son-in-law’s family to join them in Greenville, South Carolina. The only problem is trying to fit everything into the room I have in the luggage. ……Guess I’ll have to leave my clothes at home!!!!!……Oops! My mother always said, “Never leave the house without clean underwear……”, so I guess I’ll shove a few pair in my purse!!!! Love the pictures of the house…..Makes us all feel included in your amazing and courageous journey. Awesome ruler! I like that the markings have those highlights, so that you can see them. I am nearly done with my holiday preparations. Just a few handmade gifts that have a couple of small things done to them and then wrap them and done and on to the some fun with my little grandson that I watch. A trip to see Santa and our annual movies and one last special batch of candy. It is almost here! Merry Christmas! Love the rulers! Love your house! It is going to be awesome! I think I am finished with my buying, but I do have a fair amount of Christmas prep to do. I have 5 small sewing projects to get done and hope to have at least 3 of them complete by the end of the day. Nice, nice house pctures.. Thanks for sharing!! Problem.. Giving is what counts! I’m done with shopping but have to monogram a few things. Hopefully done by the end of today. New rulers would be wonderful. I am spending my day working on my BOW blocks! My daughter is flying over the Atlantic right now- on her way home. So excited!!! Love CG rulers too but I can always add more! Love the house pictures and cannot wait to see your finished studio. My daughter, who’s home from Tulane University and I will be making your Star cut out cookies today. But, I think we’re going to make them in hearts! I love your blog and can’t wait to see your lovely home all finished. Happy Holidays from New Jersey! I’m working on my 30 mini-loaves of different breads for gifts And hand-stitching binding on a quilt for my brand new grand-niece. Hope I finish in time!! Just went to look at the rulers and I think I need SOME. I am fairly new to quilting so I have the basic rulers. Who knew there are so many? Love the pictures of the house especially the water. That would be my dream. Sometimes when the sun hits it it looks all sparkly which is awesome. Merry Christmas. Thanks for the pictures, what fun! I have lots of smaller rules but I’ve never purchased all the “bigger’squares. Just the 12. Guess nows the time. Love the pictures of your lake home, especially loving the pic of the hexie floor!!! Decorating was done right after Thanksgiving. I finished my baking and wrapping yesterday. So the next few days will be spent cleaning the house and prepping food for Christmas day. Your new home looks lovely – will look forward to more photos. Not finished yet. Still some things to wrap, shopping to do, still sewing too!!!!!! It will all get done! Your house looks great. It will be nice to have everything all in one place. Can’t wait to see the sewing studio! I have several CG rulers. Perhaps it’s time to replace a couple Omnigrids! Even though I’ve downsized my Christmas the past few years, it seems like I’m never quite caught up. I still want things “nice” for my family. I see at least one more trip to the grocery store in the next couple of days. Love the update on the house. Still buying! I need to take the time to go through all of these “12” posts of yours and decide which to buy for myself!…Later this morning! Forgot to mention – Years ago I always made Christmas candy…now I do nuts and seed…’tis the time in life! I always make Ina Garten’s Rosemary cashews…if you haven’t done them, you should! Very easy and different. And, seasoned pumpkin seeds. Dry them in a slow oven, then sprinkle seasonings (i use seasoned salt, garlic and cayenne) over and stir. Then, lime juice to get the seasonings to stick to the seeds. Back into the oven to dry, stirring them occasionally…..YUM! Good football stuff, Lisa! Lisa, beautiful pictures of lake and house. Thank you for sharing. Please enjoy the blessings of all your hard work. It is well deserved!!! One question, did you tear down the original lake house or incorporating it in the new house. Happy Holidays and a blessed 2016… Thanks Lisa for all the enjoy you bring to all of us throughout the year..
Lisa-the house looks great!! Thanks for sharing. Since I’m still unpacking boxes I have not finished my shopping yet. We finally got our tree yesterday- cut from our own land for the very first year in our forever home!! The only thing I have left to do is a few stocking stuffers. The itty bitty rulers would be the perfect stocking stuffers. Love the pics of your house. Keep them coming. I am done shopping. Made a few goodies yesterday and will make a few on Wednesday. Otherwise ready for Christmas. When in Venice took dozens of pictures of floors in St Marks. Like an array of carpets all done in tile. To be quilts one of these days. And maybe a floor. Will take a look at my ruler inventory and do some ordering. School is out now so now! So I can focus on the holiday. Lot’s to do, but joyously living in the moment. Love the updates on the house. Looking forward to more. I’ve delayed ordering new rulers. I think this is the time. Thanks for all the info and motivation. Love the CG rulers!! I think they are the best on the market!! I did get myself the itty bitty rectangular one this fall & need to get the itty bitty square! I still need to finish up my shopping, clean house,& do some Christmas baking!! But those Packers are playing today, so I know what we will be doing later on today!! Your house looks Wonderful!!! Love that honeycomb floor!! Pretty darn excited for you, your a very hard worker, you deserve it!! All my Christmas things are done except getting the few groceries we’re taking along to our daughter’s house in Waunakee for our family get together. We had our neighbors over last night an d ended up dancing in the kitchen! My husband, Roger, helped frost cookies, but he said mine looked better! All I have to say is done is better than perfect! Gotta go take inventory of my rulers, I know some need replacing. Thanks! Beautiful. I hope your garage is attached to the house for those raining and snow days, for day access. Love the creative grid rulers. Thanks for the house photos. Love seeing them. Still have to wrap a few presents so almost ready. Love the CG rulers . They are the easiest rulers to see the markings when cutting fabric. I am all set for Christmas except for cleaning, my least favorite thing, would rather be quilting. Creative grid rulers are the best. Thanks for the house photos. world and care for us brings humility in His presence. Best wishes for a happy Christmastime. So happy for you and your dear family, building your beautiful lake house. Well deserved, I have seen you working your fingers at Housron, but always ready to chat with us. I need to check in my rulers, as you make a very good point!! Thanks for the tour. I have one last trip to the stores tomorrow A.M.. Then the rest of my baking I will do Christmas Eve, so that it is fresh, oh and I will wake up to dough for buns in the bread maker on Christmas morning. Merry Christmas. Your house looks amazing and you will have serenity with the beautiful view of the lake! I am prepared for Christmas and will be in power mode after to enjoy relatives and ring in the New Year on New Year’s Day. It was a tradition we enjoyed when my parents were alive and a good way to begin a new year. I will take your suggestion to replace some of my rulers and add some new sizes that I don’t have. Happy holidays! I love hearing about you new house and add my congratulations to all the other well wishers on this achievement. I’m just about done with holiday preparations except for baking. I’m just about to make some cookies for our neighbors. Sitting here in the family room on my iPad and sipping hot cider! Couldn’t be cozier! Have to do just a little more baking and wrapping and I’ll be done. Love all that you share with us. Merry Christmas! I just finished up all of the Christmas wrapping this morning, Everything is officially DONE!! Yippee! I love your hexagon floor tile for your office. Merry Christmas. Patiently waiting for the mailman to bring the last of the gifts, Christmas cards are done. The tree’s getting decorated today and maybe a batch of Spritz cookies…I found a like-new complete cookie gun in an antique shop just like the one my Mom had! I haven’t tried any of those new rulers yet but you have me nearly convinced. I love the tile work in your new office! How exciting! You will love your new sewing room. Custom designing is really the only way to get it set up the way you want it to be. I love your view. Looks like your home is coming along very nicely. I am sure you will be very happy once it is completed. Thanks for all that you do and have a Merry Christmas. I love creative grid rulers, thanks for the sale. Love that you are sharing about your home being built! Last of shopping today then onto baking! Oh so much to do! Son home from college with roommate and dog, baking cookies for cookie party, leaving for mountains for two days so hubby can work ski patrol…what about my sewing and shopping and wrapping? In other words…typical holiday! But oh so happy! I hope you all are too! Merry Christmas! These rulers are the best! I love the floor in the office. I am done shopping but have to wrap everything and start baking. Will be up late every night this week getting it done. Your house is going to be beautiful. Thank you for putting your creative grid rulers on sale! I love your itty bitty rulers and I tell all my quilting friends they need them!!! Can’t wait to get your new ruler. Your home is beautiful . You have an AWSOME view. If you want to adopt a Grandma I’m available . I am ready for Christmas. I hand make most of my gifts and I start in the summer while I am at our cottage. I too like spending time at our cottage which is on a small lake in northern Ontario, Canada. Its just a little 2 bedroom cottage but its very cozy and the view is beautiful. I’m as ready as I’ll ever be for Christmas. I made your sugar cookies yesterday, my husband is eating them so fast, I might not even get them frosted. I love the pictures of your new home. I also love the rulers you offer. A quilter cannot have enough rulers to work with. It will be really nice when you’re finished, I’m sure you’re excited. I’m all finished with my shopping here! Wahoo! Still have some baking to finish and a few gifts to buy. Decorating is done! Downsized quite a bit. Love Love your hexie floor! Would love to win the PG ruler. Love seeing glimpses of your house! I have only 1 creative grid ruler and they never go on sale so now looks like a great time! Lisa, your house looks awesome! Thank you for all you do. I’m through shopping and going to finish wrapping presents today. I love my Omnigrid rulers and have both of your itty bitty rulers purchased last year. Christmas is only 5 days away but I have so much to get done yet. LOVE your hexagon floor!!! Can’t wait to see pics of the finished house. What a wonderful place to create! I’m pretty much ready so am watching the Vikings! So far, so good. I am ordering a couple of your souvenir rulers. They will be handy. Love these rulers, bought your itty bitty rulers when they came out. I use them all the time. Wrapping & decorating done, haven’t done a lot of baking trying to cut back some! 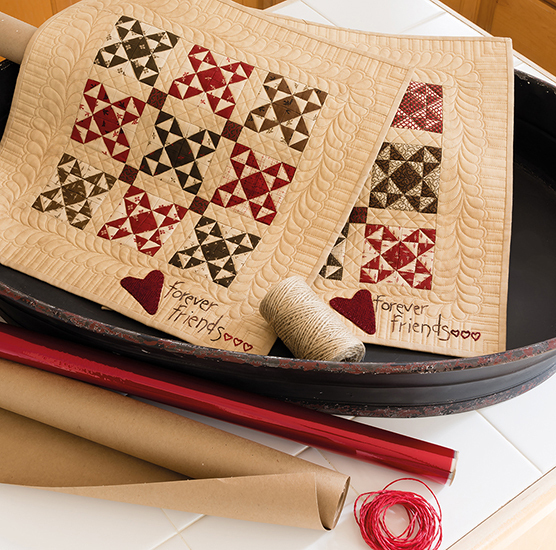 Love your hexi floor. Love your pictures and progress updates! Really like the Creative Grid rulers I have purchased from you! Have a few things left to do for Christmas, but had to check in on your Twelve Days of Christmas first!!! I finished up yesterday. I made it a thing this year to NOT shop online. Spent cash, no credit cards, and managed most at small local owned places. It feels much more like Christmas at those small places, chatting with the people than online or the grumpys at walmart. Small confession, I still have 1 of those old rulers. I Love these little rulers. Makes small blocks very easy to cut, trim and see . Great job on the designs. Your new home is coming along beautifully. It is really fun to share in the excitement of your “build.” It’s going to be beautiful and I know it will be just exactly what you are dreaming of when it is finished. Love, love Creative Grid Rulers – the best on the market and not only do I collect the little ones with shop names, I use them!! They are the perfect size and have many uses! I’m enjoying the updates on your new home. And, I’ve been using creative grids rulers for a long time, but I missed out on the tiny ones and need the 1/8 inch marking when I’m doing the small blocks. I’m guessing now is the time to add them to my ruler collection. Have to say again how much I look forward to the 12 needful things postings every day. I would be done if I had baked my cookies earlier, but came down with a cold yest so they may not get done this year! Ha! Gives me more time to do some handwork. I love the CG rulers ……..have been slowly replacing the Omingrid ones I bought when I first learned to quilt 15 yo. I could use some more! Love the house pix and the progress. Reminds me of when we built our forever home 2 yo. Thanks for all the chances to win! My shopping, wrapping, baking, etc. is all finished. We had our first Christmas celebration yesterday and will have our second on Christmas day. I was finished well ahead of time this year for a change. Lisa, your house is looking amazing. I love all of the openness of it with all of the windows and different roof lines. Thanks for sharing your progress and hope it goes quickly so you can be moved in soon. I like being part of the 12-days-of-needful-things and reading your blog. How kind of you to share your house-building experiences. BTW: I have to sew the bottom seam to a Party Tote bag and add a magnetic closure. Then, I’m done with gifts. Love the hexie tiles and the roof line. Keep posting pictures! I can hardly wait to see the finished house. Loved your lakeside gatherings colors– to me it says peace, love,happiness and sunshine! Thanks for the ruler discount! I would like the 8.5 x24 inch ruler please. Thanks! I absolutely love Creative Grid rulers. I do not like cutting, so I definitely need all the help I can get. Love the non-slip features. I need to replace some of my old rulers. Now–thank you for posting your home pictures. I love studying floor plans and seeing how people adapt to their own needs. It certainly looks as if you are doing a great job building to your needs. Almost finished wrapping and then ready for Christmas. Thanks for the discount on the CG rulers. They are my favorite. The design of your house is amazing. I will be updating some of my rulers. Already have your itty bitty rulers. We had Christmas this weekend with our kids and grandkids. So much fun. So my shopping is done but I still have cookies and candy to make for this upcoming week. Need to make chocolate balls and also pecan cookies. The pecan cookies are covered with powdered sugar and they look so pretty on a tray with the chocolate balls. These are two of my Mom’s recipes. Always think of her when I make them. Love Creative Grid rulers, they are the best! Just some cleaning and cooking to go. Babysitting tomorrow, Nutcracker on Tuesday, 2nd daughter and her boyfriend arrive Wednesday and then the celebrating begins with cookie making with 22 month old granddaughter. Can’t wait. LOVE the view you will have in your new home! Going to be wonderful! My house is decorated, but STILL have gifts to buy next week – this is the latest I’ve ever been for Christmas. Don’t know what happened this year – I have been soooo disorganized and only just now getting in the Christmas spirit. Merry Christmas to you and your family, Lisa. Hoping to see you again in Paducah next year! Thank you for sharing your new home with us. Rich blessings await. It is absolutely divine even without all of the finishes. I look forward to more photos of your journey. I have a little of everything to do yet…baking, shopping, wrapping, decorating, and working plus a couple appointments thrown in too! My daughter is coming home from college today, so she will be a big help! I can’t wait to see her. I have just a little over an hour to get her bedroom cleaned out of all my projects so that she has a bed to sleep in! break time is over…….gotta get movin! I am alllllllllllmmmmmmmmmmooooooooost done…..everything is purchased, and it has been put out in piles by recipients, but it all needs wrapped. That won’t be too hard because years ago I made multiple sizes of fabric bags, that we have used yearly ever since to wrap our gifts in. Wow, if I were beginning right now I would be using Primitive Gatherings fabric………can’t you just imagine how that would look under the tree? Magnificent!!! Maybe it is time to update….just like my rulers that need updated! But right now, I must head over to babysit my grandsons whilst my daughter and son-in-law go out to eat and shop. are now reaping the benefits! A beautiful new home! You are a talented lady, and I admire all that you’ve done! Looking forward to seeing the finish of your new place…. Just a few things to wrap. Thank you for sharing the house pictures. First thing, No! I am. ot done with Christmas preparations. bah humbug! Seconf, I hope you are putting lots of i sulations in the walls, ceiling and FLOOR of your studio! I once had a beautiful room above the garage, the people that built house didnt insulate the floor. It was freezing in the winter, we ended up not even using the room because it was way too cold! again, bah humbug! Well you are ahead of me in the “done” category. No cookies yet. Couldn’t find the box with the traditional recipes until today. We moved and things are a bit of a mess! The house looks beautiful and how wonderful to be on the lake on a daily basis, it is a blessing. It is great fun to see what you are doing and the choices you have made. I am all done shopping and wrapping for once. Sit back and stitch. Ahhhh! Wow, nice place. Love the floor in your little office and I would think having your sewing studio a bit away from the rest of the house will be great. Beautiful view of the lake! And then there’s Christmas… no not done YET! I like to give my Dr. and his office staff little something and this year I am having a hard time figuring out what to give. Ugh. Also making the neighborhood kids cookies today which, I usually take to their doors on Christmas Eve. Here’s wishing you a very Merry Christmas with gifts of love, hope, health and prosperity. Creative Grids rulers are the best! Gift shopping is done and now the wrapping needs to be done. Grocery shopping is done. Still need to bake a few cookies and take one package to the post office tomorrow. It’s coming together slowly. Been enjoying the pics of your new home. Love your tile floor design! Enjoy stitching today! Love all your pictures! I’m still wrapping so much work , but my little girls love to open gifts. I love a ruler that’s easy to read. I love these rulers, never can have enough! Presents are bought and I baked cookies and made candy all day Friday. So as ready as I will be! I do not have a creative grid ruler but I think I could really use the 6 1/2 by 12 1/2. (hint, hint) I have been enjoying your posts. Love the house. I live rulers. They make me happy like fabric does. Love the updates on your house! Can’t wait to see pictures of your sewing studio (……please!!! I need on inspiration for mine). Holiday stuff is a go except for wrapping gifts. Love the tile floor. Love my bitty rulers too! I love your 12 days if Christmas cause you don’t have only one day to order. If I am not at home I can catch it the next day! Still wrapping gifts and getting everything ready. Haven’t read the comments today yet so I have a question…Has anyone made Lisa’s star cookies yet? Lisa-so glad to see that your dreams are coming true-I see you at shows all over the country and know you do not accomplish all that you do without working hard. As for the negative people in the world-my good friend always says “LIFE IS TOO SHORT TO DANCE WITH UGLY WOMEN!! Enjoy your dream and never let them steal your joy! Love that floor! In fact, I love looking at all the pictures of your new home! it is lovely! Received my mug and it is beautiful! I love it. I am just about done with gifts, but the tree is still not up. Hopefully it will happen today. The rest of my house is so decorated that a tree is such a small part. Could it be time for artificial? Doubt it. You’ve convinced me that it’s time to start upgrading my rulers. I appreciate your recommendations on preferred sizes. Love the floor tile hexies. Love creative grid rulers, I have slowly replaced all of my old rulers. I am making your minature quilts, I did not think about the bitty rulers, but purchased them and when I started cutting could not believe what a difference they make. Thanks for coming up with these! Love the the creative grid rulers. They are my favorite. Still working on Christmas projects. Love everything about your new house. Can I move in too? Keep posting updates. I finished up today – all done but some wrapping! Your house looks gorgeous. I can’t want to see it when it’s completed! Still have my wrapping to do! I still need to buy a few things, wrap gifts, and baking starts tomorrow. I have a quilt to finish tonight, so I can get the other things done. Thanks for sharing pictures of your house and for the info on the rulers. Last year I started replacing all of my rulers with Creative Grids and it has made a big difference in my accuracy. It is so fun to see the progress on your new home, and to have pictures to go with your descriptions. The tile is fabulous! thanks so much for sharing. I’m almost done wrapping, then next week I need to get this house cleaned and ready for our 12 grandkids and their parents to arrive. 24 of us will fill this house! We haven’t all been together since our youngest sons wedding almost six years ago with 3 deployments since then. I get emotional just thinking about having all my chicks back in the nest for a few precious days. I have been a bit sidetracked with all you new ornies. I completed 5, but still have a few more left to do. They are calling to me but I have to be strong and get busy! It makes my heart sing when I see an email from your blog or the shop blog. Wishing you the merriest of Christmases! It will be so much fun with your little grandson this year! Thanks for all you do, dear, Lisa! Christmas is always a work In progress. Every year I think I’m going to start earlier but don’t. Maybe I like the chaos and pressure to get it all done, seems pretty crazy. I need to remind myself the “reason for the season” – that’s what is important! Great Photos and NO I have Barely Started any Holiday decorating, no baking done at all, and I have to work on Christmas Eve, Christmas Day etc… + the same for New Years Holiday… cant get in the mood either. I need to at least make the flannel nightgown for my Granddaughter for Christmas gift.. Merry Christmas every one…. Christmas Tree is sitting in the living room . just there no lights or decorations on it yet..
Tree is up,house decorated, but I only have me to decorate for. I still sew daily and the many Hallmark shows provide time for hand sewing on the SBOW 2015. I am really enjoying the bow tie blocks from the California store. Smaller seems better ,more of a challenge. Thank you for the patterns special supplies and fabric lines oh and the lovely fabrics available in your shop. A Holy Christmas to you and your family. it is beautiful to me. Love all your house stories. Your house looks amazing!! Thanks for sharing it with all of us. I love Christmas but with the unexpected passing of my father a couple weeks ago and my brother this past May of cancer my heart does not have its usual joyous spirit. But am going through the motions and will celebrate in their memory with laughter and I’m sure a few tears. Love Creative grid rulers and the PG size is great for small quilts. I am starting my baking tomorrow. Love how it makes the house smell. I am a recent convert to CG rulers because of your itty bitty eighths rulers! Thanks so much for offering these great rulers. I am done shopping, have things wrapped and tagged but need to add ribbon. I spend lots of time doing fancy ribbons because that’s my favorite part. Kinda silly I suppose, but I enjoy it. I have one big batch of cookies left to bake tomorrow and then dear daughter and her hubs get here and I will have help doing the rest of the cooking. I think I may need to replace my rulers! You just pointed out the obvious to me! Thanks Lisa! Can’t wait to see your quilting room when all done! Still have a few things to buy, and one sewing project to finish! Your home will be great and what a beautiful view, wishing you and your family a very Merry Christmas. I ordered the 8 1/2″ wide ruler when you featured it on the 12 Days a year or so ago and I absolutely love it!! I finally finished putting up the last decorations for Christmas this afternoon and will try to finish up my shopping tomorrow. Then wrapping on Tuesday and cleaning on Wednesday. Almost there! The tile is beautiful. It will be so nice when you are able to be there full time. Love that the pups will have their own couches. Creative grid rulers are so helpful. Love that they don’t slip when you use them. Would love to have a Primitive Gatherings ruler. I will have to add one to my next order. Hope you have a wonderful Christmas. Hexies!! Love your property, when can I visit? Need to wrap and I am ready for Christmas. I love Creative Grids rulers also, my favorite is 2.5 by 6.5, did not think that I would like it, but I use it all the time! I am so proud of you. I have been a loyal fan of yours and your wonderful store for years. May the new home bring you happiness and joy–a lovely haven for renewal. God bless you and yours. Wow, a sewing room om the second floor, I can only imagine what the view will be like to look out at that lake! I sure wish someone had told me about these being the best rulers when I started quilting 7 years ago. I am building a nice collection of them over time replacing inferior ones. Luckily I found you shortly after I started quilting and I think I have learned the most from you and I direct other new quilters in your direction. Hopefully I will be able to take a class with you one day! I only wish I were finished. I am still decorating cookies and have yet to make my pizzelles – a family tradition and favorite! I also still have some shopping for the grandkids. Got the big things, now the small. Your new home looks awesome! Congratulations to you both! I love, love, love the Creative Grid Rulers! in the middle of this busy time of year. got to check out the sale on the rulers! I have the rulers. Actually both of yours. The house looks great. The frozen lake?? Wow cold. Not in CA and not even in WA where I moved from. BRRRR😁😁Chatter Chatter!! Have a nice Christmas. I’m still sewing some binding on a wall hanging I am making for my best friend for Christmas!! Except for that I am done with Christmas shopping, but still have some baking to do! Love that your dogs have their own special room!! My dog is jealous!! Only a few more gifts to purchase! Love seeing the progress on your home! Merry Christmas to you and your family. 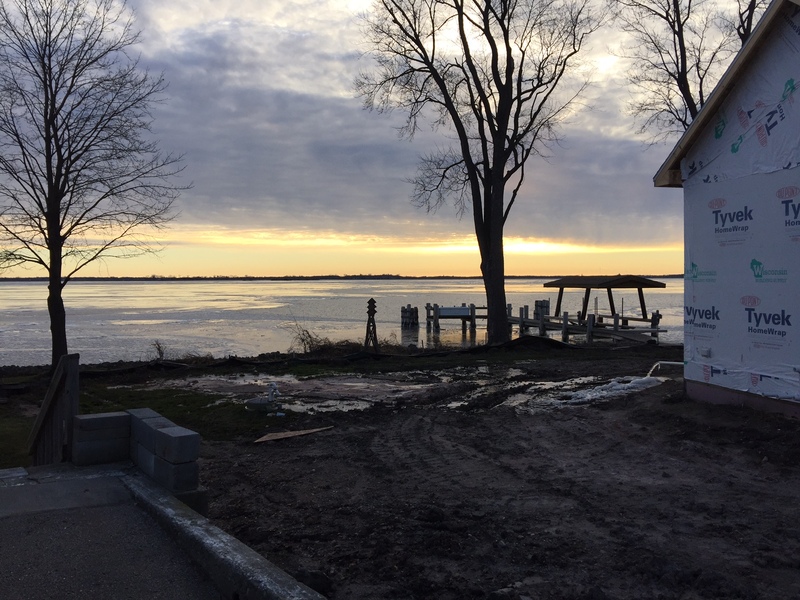 Thank you for sharing more pictures of the progress on the lake house. It looks amazing. I had a cookie baking marathon this afternoon and tried your Christmas cookie cut outs, delicious. I still have a few sewing projects to finish off and wrapping to complete, but it will all get done just in time. Great rulers! I would LOVE to win one – especially a PG ruler 🙂 I’m almost done with my shopping. Wrapping presents is my favorite part!! Happy Holidays! Gifts have been wrapped, just need to do some baking. I like the creative grid rulers. I have to buy a stocking for my furry child ☺️ Love your hexi floor ! I am a long time user of Creative Grid rulers, but am most impressed with the newer ones that have the grippy stuff on all four sides of the rulers ! It really helps to keep the rulers in place to make accurate cuts. Your house is beautiful! I got the last of the cherry fudge made and have 1 more batch of sugared pecans. Nasty wind closed down I80 for 3 days so some packages will be late arriving. But Christmas projects are bound and wrapped, now on to the Hedgehog quilt for my January grandbaby! If Creative Grid Rulers are really non slip, I would love them. That’s a major problem with the ones I have now. Your dream house is amazing! Love that tile floor! I have your Itty Bitty rulers and love them. I hope to finish getting the last of items in the next few days . Ok now I’m confused. Are you building a new house on the lake or updating the old house on the lake? Whatever I love seeing the pictures. I bought those rulers when we visited with you in October…there are the best! Love the lines of your new home. So many wonderful items on your 12 Days of Christmas – thank you! Our one son in law is a Police Officer and will be working Christmas so our family all got together this weekend. What a wonderful time we had as a family…so much love! Creative Grid rulers are the best. I’m still shopping and baking. Cutting it close this year. I took my Somewhere in Time quilt blocks in November with me to a retreat in Darwin MN to show a girlfriend. She just sent me a pic. Her family bought the kit for her for her birthday and early Christmas. So exciting. Well, the gifts are all done up & ready to share, the cards are all sent, the house & yard have been decorated for a couple of weeks now, but the baking, well, the baking continues. Of course, the baking is pretty much year-round (maybe almost daily?) here, so that’s really no surprise. I am not done with baking and also have a few gifts to buy yet. I think I’m ahead and then it’s the week before Christmas and I’m not ready. Oh well it always works out. I love what you’re doing to your lake house and look forward to seeing your home and studio all finished. I can’t believe Christmas is only a few days from now. Today I did some last minute shopping. Merry merry to all. This is my first time to follow your needful things postings. 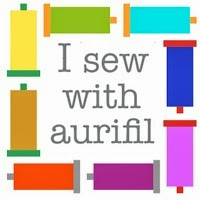 I am a gadget girl and I really enjoy seeing what other quilters find useful. Almost ready for Chrismas, have a few projects that need final toucheson them. We are trying hard to stay out of the crowds. I just, literally, finished wrapping all the presents. Now, to finish two, but I need something from my quilt shop in order to finish!! Lisa, looks like your new home with be gorgeous! 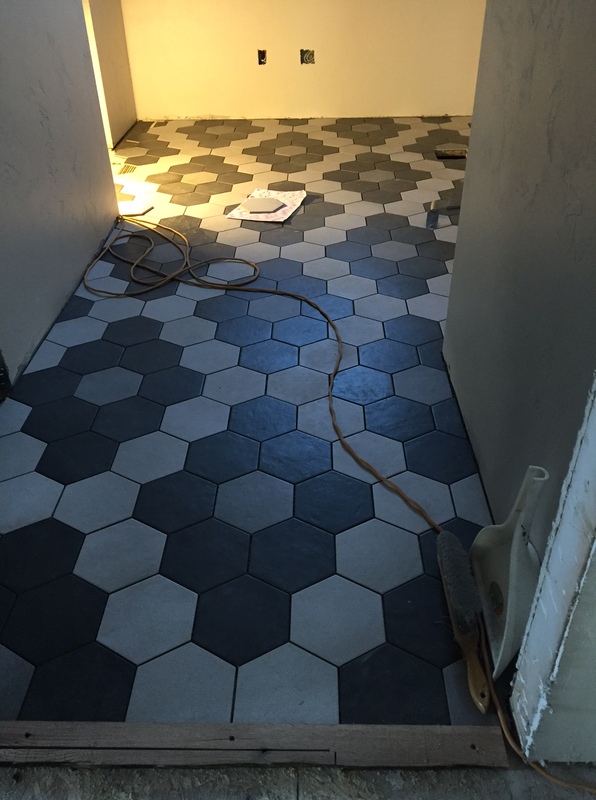 Love the hexagon tiles for flooring….custom size? I have just recently started buying Creative Grids rulers. I only have three, but have my eye on several. They are fabulous! I thought I was almost finished with all the Christmas prep, but when I read the previous posts, I realized that I have alot left to do. Most of my wrapping is done, but still have cleaning to do and some sewing to finish. Tuesday, we make a day trip to Florida to see my 91 year old dad, who is terminally ill with cancer, and take him his Christmas presents. He is so special to me. When I was three and begged for a bike for Christmas, he made sure I got that bike, even though he had to put cardboard in his shoes to cover the holes. So instead of him getting much needed shoes, he sacrificed for me. I will never forget that, even though it hurts me to think of it. We will try to make Tuesday a very special day for him. Love the pictures of your house-it’s really coming along. Beautiful! After getting your Itty Bitty Eights rulers this year I switched out all my rulers to Creative Grid. So happy I did that! Nice, looks very neutral just like you described. The floor could be hexies. LOL… NICE! Hi Lisa, your house is coming along nicely, I can’t wait to see how you decorate it please share photos. I have my house totally decorated, presents wrapped and the baking is complete now all I have to do is enjoy my family and the next few days leading to Christmas. My grandma taught me to start my Christmas shopping in August so that the day after Thanksgiving when everyone is out in the crowds I can be home wrapping gifts and decorating my house (very wise woman). I have 4 CR rulers now and am slowly changing out the older ones, the first one I purchased was to make your “Pinwheel Garden” and now have treated myself to your “Sunflower Gatherings” for 2016. God Bless you and your family for all your hard work and bringing us such beautiful patterns. Almost done….just need one more gift and a few stocking stuffers….hopefully tomorrow! I love Creative Grids rulers! I am slowly trying to replace my old Omnigrid ones. Love the hexie tile floor! Shopping is done, wrapping is done! Baking still to finish. Done shopping.. just need to wrap presents. Love the Creative Grids. What a beautiful site for your home! I love your blog and store. I have purchased a few items and am currently enrolled in the valdani club. I love wool applique and made my Christmas gifts early as I had hip surgery Dec. 15. I am getting around okay but miss my quilting time and applique time! Thank you for so much enjoyment reading about your stores! I live Pennsylvania but maybe some day I will get out your way to see your store and beautiful work you do! Thanks again and Merry Christmas! Your house looks great, love the hexie flooring. As for being ready for Christmas I still have 2 table runners to quilt and bind. I see some late nights ahead but that’s OK. Love your rulers. Creative Grids rulers are the best – I got rid of all those old ones with the thick lines. 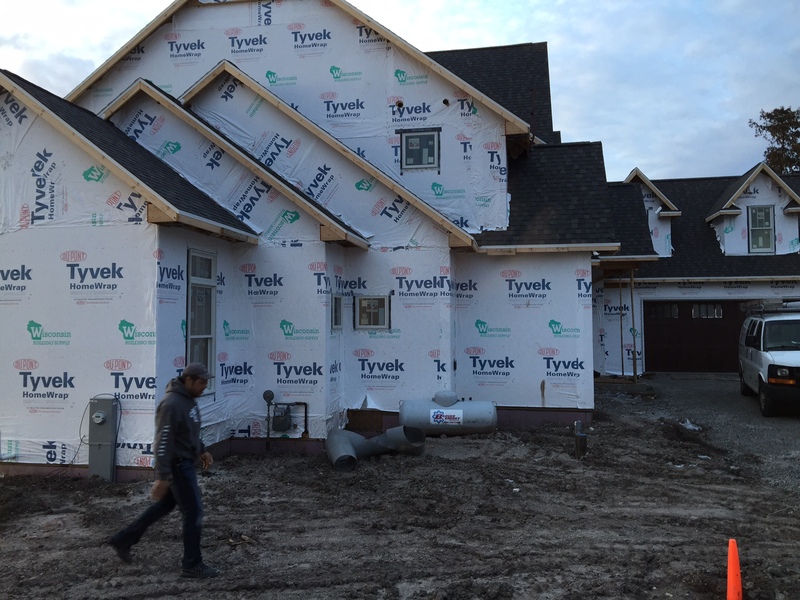 Your house is going to be awesome – thanks for sharing – it’s fun to see the progress. I have recently begun acquiring Creative Grids rulers. In time, I will have all my old rulers replaced. I’m ready for Christmas! Now baking cinnamon rolls for the neighbors. Yum! Very pretty house! They have done a lot since the end of August! I love the itty bitty rulers. They are my favourites. Although all of the jobs are not yet done I am always ready for Christmas to come as it is such a special time and look forward to it all year. Creative Grids rulers are the best! Almost ready for Christmas, just a couple of little gifts to get and little bit to wrap. Need to make the cookies and then I’ll be done. Thanks for sharing. How fun and great to see the constuction progress! Thanks for sharing and so happy for you!! I can’t wait to see your sewing studio. I just love that floor and thought why didn’t we think of something like that when we redid our entryway floor! Oh well, I enjoy seeing yours. I love reading about your new house and so enjoy all the photos of its progress – and can’t wait to see the doggie room – what a great idea! Your new home will be beautiful! Merry Christmas Lisa and thank you for all you do and also for all of your inspiration throughout the year! Peace to you. Those rulers are great. And I think the hexi floor is perfect! It’s so nice of you to share the progress of your new home. I’m enjoying the pictures and the sharing of the building of your house. I hope you keep it up. It’s like our own personal hgtv show, except with a quilters perspective. Love it. House looks awesome and the location is amazing! I am done shopping and my daughter, sil and littlest grand daughter s arrive tonight. I am in a cooking baking frenzy but so excited! And I love Creative grid rulers especially the itty bitty, it’s perfect for so many up close jobs! My Christmas preps are almost done – maybe one more cookie batch to make. Its the 80th birthday party we are having for my mother in law on Dec 26th that’s got me going crazy! 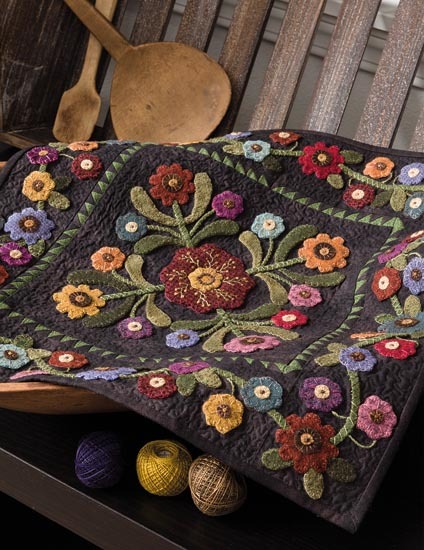 The house looks great – love the hexi floor! Ruler looks cool to have handy and great in progress house photos! Merry Christmas. Never enough hours in a day at this time if year. Still have wrapping to do. Just found out majority of family are coming a day early, yikes. Yes, having two homes is very challenging. I have some duplicate rulers, basic sewing supplies, I haul everything else. Car is packed. Good thing we are retired, can stay for long periods of time, and everything doesn’t come home, lol yes, I agree, old rulers need to be pitched! Dangerous! I really love the creative grid rulers non slip feature! I have been replacing some of my old Olfa rulers with creative ones! Merry Christmas ! Still have shopping to do ! I love creative grid rulers . I am starting to replace some of my Olfa rulers with these. I like the non slip feature of creative grids . Merry Christmas to all! Still shopping for Christmas ! Love your pictures –I know you will love full time lake living!! I am done with my christmas shopping as we celebrated early!! We are done here and hoping to enjoy the last few days before Christmas. I love Creative Grids rulers, after using other brands they just do a better cutting job! House looks awesome, it might be too wet but I bet this warmer weather is helping the finish date a little, yes. I love the creative grid rulers. Over time I am replacing all my 25 year old rulers. You are so right about the disappearing lines and the loss of accuracy when cutting. love the creative grid rulers. Have been replacing mine. Love the flooring in your new home. I love the Creative Grids rulers that you designed! They are awesome. I have them both and don’t know what I would do without them. I really enjoy seeing the progress on your new home. I have shopped at your booth at shows all over the the country and it is always such a pleasant experience.